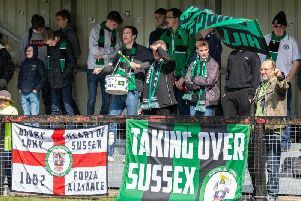 Worthing have been challenged to brush off the defeat to newly-crowned Bostik League Premier Division champions Dorking Wanderers - and claim a play-off place. Adam Hinshelwood is determined for his side to respond in the right way following a 3-0 defeat at Wanderers, which took them to the title. Worthing were on a ten-game unbeaten run prior to the loss and they have been tasked to finish the season strongly. The club are fourth in the table and in the driving seat for a play-off place. Hinshelwood said: “It reflects where we are, there’s a lot of young players and I think we’re a long way away from Dorking to be honest. “We need to dust ourselves down now, learn from the defeat to make sure we finish the season well. Jason Prior’s penalty eight minutes before the break gave Dorking a slender half-time lead. Luke Moore doubled Wanderers’ advantage 25 minutes from time before Lewis Taylor rounded off the scoring as the hosts were crowned champions. Hinshelwood added: "They were by far the better team on the day, we didn’t really get going and probably rode out luck at times in the first half. "Maybe there was a bit of naivety on my part to set the team up coming to a place like this, but they're a class side and deservedly won the league."